Try and recall for a minute: your first job. Yes, that job when you were a twenty-something fresher, eager to learn and impress everyone. Reminisce about the felicity of the first ever pay cheque. We are sure; it was no less than a grand celebration for you. Before you zone out taking a trip down memory lane, we would like you to think for a moment how much you used to save during those days? Many shun the idea of saving for the future. A lot of times, it is the last priority during the early years of one's career. Naturally, one doesn't worry about health insurance during these days. However, as we move towards our sunset years, health begins to rise on our priority chart, after all, our body gives in to the invincible cycle of age and time. On the brighter side, retirement may not be all things dull and grey. One of the joys of being a senior citizen is that your working years are over. There is no nasty boss, strict work deadlines to follow and office politics to bother you. Retirement is a time to relax and do things you always wanted to do. However, to enjoy all the perks of a retired life, it is essential to be in good health. Add to this, the fact; medical expenses are bound to inflate year-on-year. Further, due to medical advancement and improved clinical outcomes, life expectancy has been consistently increasing. While it is good news, it also poses a serious problem for the one who is not financially strong and economically active. The first and the foremost thing to do is to start planning today. It is immaterial how young you are, the sooner you start saving for your health, the better it is for you. 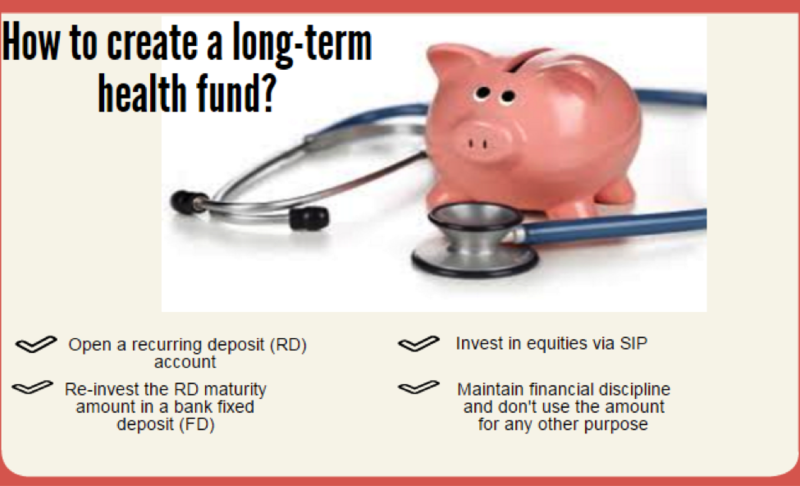 In addition, the savings lying in your retirement fund will also generate interest, thanks to the power of compounding. To tackle the question of how much you need to save for your health, consider your current scenarios of expenses and assume the rise in costs in the next few years and keep on adding 8%-10% to it. Moreover, when you start saving from a young age, you can begin with investing a small proportion of your salary comparatively since you have enough time to accumulate your funds. *We have assumed the monthly contribution is Rs 3,000 and the rate of return is 8%. When you decide to opt for a health insurance policy, ensure that its features are in sync with your present and future healthcare needs. Clearly, understand all nitty- gritty of the policy and buy it only if you are sure that it will help you. For instance, there are surgical cash plans available in the market, which make a fixed payout in case the policyholder is required to undergo surgery. However, first, it is necessary to secure your health with a comprehensive health insurance before adding any other plan to your insurance portfolio. Similarly, it would not be useful to have top-up and super top-up plans if you don't have sufficient funds to cover the deductible limit either from your existing health insurance policy or own funds. While it is good to have a health insurance, it is equally important to ensure that it is sufficient. Healthcare inflation is rising at an unprecedented rate. The magnitude of health cover that may look ample today might become insufficient soon. For instance, a simple knee replacement surgery that may cost around Rs 5 lakhs today, is likely to cost between Rs 15 lakhs and Rs 20 lakhs in the next 8-10 years. So, we suggest, don't be penny-wise and pound-foolish. Think of the future. It is during an old age that you might need frequent medical aid; therefore, you should go for the policy which allows you to renew your plan till the maximum age. It doesn't make sense if your health insurance policy ceases to exist once you cross the age of 60. Whatever you are paying, make sure you are reaping the maximum benefits out of it. Your premium amount should be commensurate to the features of your policy. So, make a proper comparison of different policies before settling down on the one. Go through the policy document in detail to comprehend the offerings and features offered by various health insurance policies. Features like automatic policy renewal, overseas treatment coverage, free health check-up, etc. ; are some of the benefits that you can enjoy in your policy. It is a vital aspect that should be considered because if your insurer has a tie-up with good hospitals and clinics, you can get a cashless treatment at those places. In other words, you don't need to shell out money on the treatment as the insurer will take care of all your expenses. Ideally, you should go to the insurer that offers cashless facility at a good number of network hospitals and that too within your geographical area. While you should know what your health insurance policy covers, it is equally important to know what it doesn't. Before you finalize a policy, go through the exclusion section yourself and do not simply go by hearsay. The 'exclusion' section of any insurance policy is very important as it informs you about ailments and expenses which do not come under the purview of a health insurance policy. Be proactive on this front, else be ready to get the shock at the time of claim settlement. As per the clause, a policyholder will require sharing a part of the medical bill with the insurer. For instance, if the co-payment clause says 10%, it means for every claim of Rs 100, the insurer will pay Rs 90 while the remaining Rs 10 would be paid by the insured. It is necessary to look into a health insurance policy that comes with a lowest co-payment clause. Retirement is not the end of life; it is just the beginning of a new one. The mainstay of opting for a health insurance is that at the time of retirement, your savings should be spent on things which you planned for later. So, while your health insurance plan takes care of your biggest concern; health care, you can without misgivings, freely indulge in all the things you meticulously planned for later. Further, by opting for a super top-up policy, you can expand your health insurance coverage. When you are hospitalized, the insurer will pay up to the insured limit. A super top-up becomes active after you cross the sum insured limit. For instance, you have a health insurance policy of Rs 10 lakhs and super top-up policy of Rs 10 lakhs with a threshold limit of Rs 5 lakhs. In this case, super top-up plans will offer coverage only if medical bills exceed Rs 5 lakhs. In case you are hospitalized and are required to pay Rs 15 lakhs, your health insurance will cover Rs 10 lakhs and the remaining Rs 5 lakhs will be paid by your super top-up policy. Moreover, you can buy a super top-up policy with or without a health insurance cover. Even if one is retiring, it is worthwhile to opt for a health insurance cover that can cover pre-existing illnesses, once the corporate health cover ceases to exist post retirement. Also, keep in mind the age at which you wish to retire or are compelled to retire while choosing the right health insurance policy. Needless to say, factor in your spouse's health cover requirements while picking your insurance policy. After all, their health is your responsibility too. Finally, one more thing to note, despite buying a comprehensive health insurance policy, there will still be some healthcare expenses which will not be covered by a health insurer. Health insurance companies in India offer coverage only for curative measures and not for any voluntary procedures. Further, dental treatments are also not covered by most of the health insurers. Hence, it is necessary to ensure that you or your spouse are not off-guard during the retirement years and therefore, create an exigency health corpus for these expenses. Remember, our present decisions decide how our future will be. A healthy and a happy life is intertwined. The ability of any individual to enjoy the retired phase closely depends on the quality of health. Post retirement, there should not be a situation when a retiree needs to liquidate savings in case of a medical emergency. The older you are, the harder it becomes to buy a health insurance. So, save well 'today' to have a happy and healthy 'tomorrow'.